Increase Sales With Better Presentations What’s the quickest way to get your money back after investing in a boardroom control system? To bring more money in! We incorporate the best audiovisual components in the industry so you can create impactful presentations for prospective clients whether it's in person or conferencing in from around the world. In addition to great visuals and sound, the right control system helps you streamline presentations for a better first impression. With centralized, intuitive control, it’s easy to pull up the content you want and conference in new people. With an interactive whiteboard, you can even make notes on the screen in the middle of a presentation. When you’re not fumbling with your technology, you give off a much more professional image to clients or partners. Let’s begin with the concept we just introduced in the previous section: quicker meetings. Most offices only have one or two boardrooms and scheduling them is a constant hassle. By reducing preparation and meeting times, you can increase the usage of your rooms and your employee’s billable time. Combining the best in audiovisual technology, a robust network, and smart control, you can conduct seamless video conferences.With the comfort of knowing your technology can convey your message as well as an in-person meeting, you can reduce travel costs. These costs can be expansive for any company due to the price of tickets, hotels, and productivity losses. Since it has a wide array of functions, there are also a lot of lights in your boardroom to support each activity. The same goes for the room’s equipment from televisions to speakers. Make sure you’re only using what you need by saving pre-set scenes with your personal preferences for presentations, video conferences or team meetings. These scenes save the lighting, display and audio you need and pull it up in a manner of seconds. There’s also another common boardroom feature that can be a significant drain: the wall to wall windows. These are great for providing guests with a view and boosting your team’s morale with natural light. They can also be a big burden on your office thermostat. Install photo sensors that close shades when the sun the hits windows directly or use the remote monitoring in your boardroom control system to ensure shades are always closed when the room is not in use. Want a solution that can reduce costs while also increasing sales? 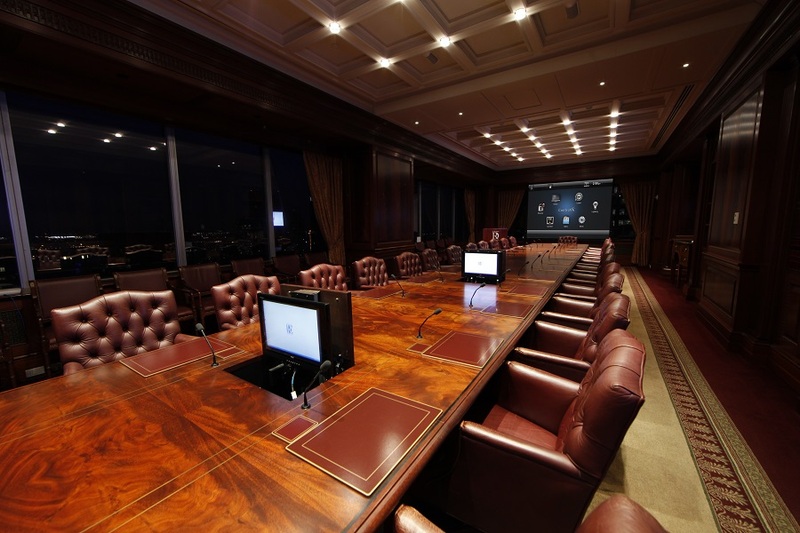 Contact Lelch Audio Video to install smart boardroom control in your office.